Insect Art: Fabric from Spider Silk! I found this very interesting article in the New York Times and thought you all would enjoy it. For possibly the first time in documented history, someone has managed to make a fabric out of pure spider silk. Have a look! 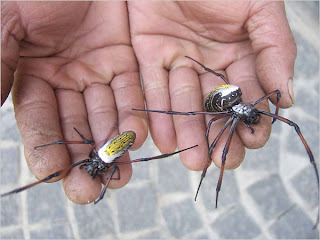 The largest spiders, the females, can grow to about the size of a small adult human hand, with hairy stiletto legs and the ability to eat large, flying insects. 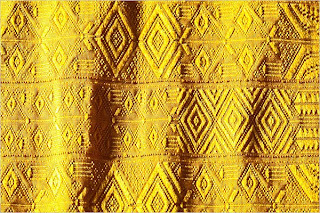 Only the females produce the silk, which is renowned for both its striking saffron color and its tensile strength (five to six times stronger than steel by weight). But these females are notoriously cannibalistic and if left to their own devices will quickly reduce the entire silk assembly line to arachnid carnage. They don’t seem to want to work in the winter, and when it rains too much, their silk becomes viscous and cannot be used. And if the spiders in the factory begin to disappear mysteriously, it might be because, in Madagascar, one of the poorest countries in the world, it is believed by some that eating these spiders, fried, is good for the throat or just good eating. “There was, shall we say, a fairly steep learning curve,” said Simon Peers, a British art historian and textile expert who has lived in Madagascar for two decades. Five years ago Mr. Peers and Nicholas Godley, an American fashion designer also living on the island, began a partnership to do what no one there, or anywhere, had tried for more than 100 years: to harness spiders to make silk in the same way that silkworm cocoons have been used for thousands of years. The other day in a fourth-floor storage area deep within the American Museum of Natural History, two women wearing blue rubber gloves carefully pulled back a plastic covering to show what Mr. Peers and Mr. Godley — along with more than a million spiders and a dexterous team of intrepid Malagasy spider handlers — had accomplished. It is an 11-foot-long, brilliantly golden-hued cloth, the first recorded example of a hand-woven brocaded textile made entirely from the silk of spiders, according to experts at the Museum of Natural History, where beginning on Thursday it will go on display for six months in the Grand Gallery. The first well-documented effort was made by a wealthy Frenchman, François Xavier Bon de Saint Hilaire, who wrote a treatise on his work in 1710 and made enough silk from spider cocoons to produce stockings, gloves and, by some unreliable accounts, an entire suit of clothes for Louis XIV. In the late 1890s in Madagascar, where fishermen had long used spider silk for rudimentary nets and line, a French technical-school official mounted another spider project, this time extracting the silk directly from living spiders to be twisted into threads. He was said to have harvested enough to fashion the hangings for a bed that was exhibited in 1900 in Paris, though the hangings no longer exist, and historical accounts differ as to how much fabric was actually created. Mr. Godley, 40, ran a business in Madagascar making high-end raffia handbags, and while visiting Mr. Peers, 51, several years ago in Antananarivo, the capital, he noticed an odd-looking metal spool in Mr. Peers’s office. The spool was a re-creation of a piece of equipment that had been used in the silk harvesting effort a century earlier. It fired Mr. Godley’s imagination, and he began trying to talk Mr. Peers into reviving the effort. The spider would then be placed in a harness, with 23 others, and sit more or less patiently as a spool tugged the rest of its web out in continuous threads that could sometimes stretch as long as 400 yards before the spider had given its all. These 24 threads were then hand-twisted into one and joined into 96-thread strands that served as the foundation of the textile, which is brocaded with traditional Malagasy motifs. And what became of the spiders, without whose very personal contributions the textile would not have been possible? While some died in its production, Mr. Godley and Mr. Peers said they set up a system in which the spiders being used were released daily, and detailed spreadsheets were kept to chart the number of spiders used, their yield and the casualty rate. As soon as the warm season in Madagascar begins next month, and the golden orbs begin productively spinning their webs again, the two men will begin making more cloth, which might find a market in the reviving fashion industry. But Mr. Godley said that he and Mr. Peers harbored few illusions, at least so far, about making a business of their strange gossamer obsession. I have seen the golden orb spider in Costa Rica and it is an awesome site. The males are super tiny and you can barely see them. The female is really that big but she is gentle. I am now a scientifc illustrator but I used to be a handspinner and weaver..... It would be really cool to spin some thread, weave a cloth and then paint the female! I wonder how long it would take me???? ?